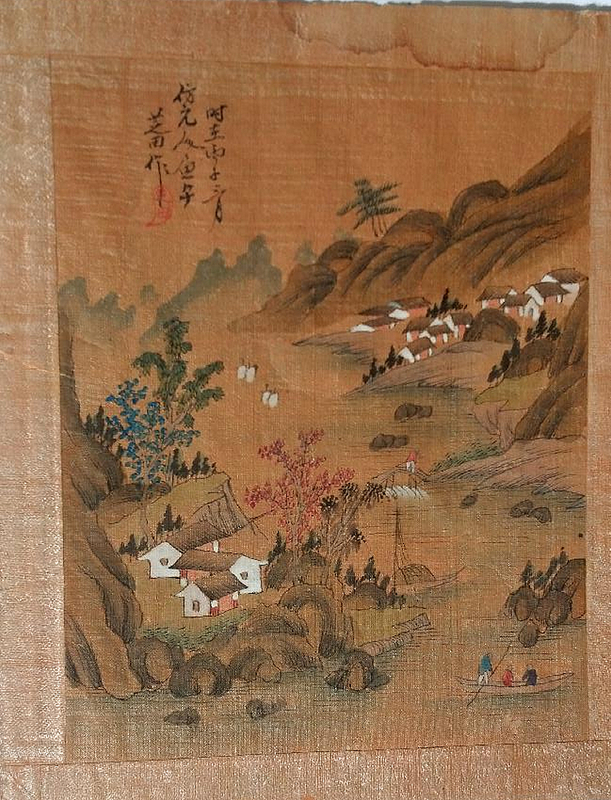 I'm very excited about this 17th century Chinese painting I just purchased and am continuing researching it, hopefully to find out more about the artist and if there's more works by this artist who simply signed his name as Tse-Tien according to artist, curator, and professor Ling Fu Yang. (Note: I believe it more likely to be Tian since the character is 田 whereas the character for Tien is 十 which is pronounced Shi, although it is doubtful in my mind that Ling Fu Yang would make such a mistake, but more probably that she used Cantonese. As for Tse, or Xie, Ze, Zhi or other potential variants, it is rather difficult for me to see and determine which, due to my poor eyesight, the small size of the signature via the red seal and the fact that it's written over black, making it more difficult for me to read. Asking around for help, I was told that it's possibly Zhi Tian, but Tse, which sounds very similar, the character for it 謝 is also for Xie , but Zhi is 志 and I can't determine which it is on the painting itself, however, due to Ling Fu Yang's assesment, I believe the person who told me Zhi Tian is incorrect in his translation, so it may be Tse Tian, or Xie Tian I believe. One thing that's peculiar to me about this painting is the shape of the seal, which isn't signed with a traditional chop seal, but appears to be hand painted in what I can only describe as a distorted teardrop shape rather than the standard, traditional square, circle, oval, etc. 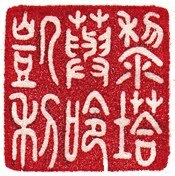 I have never seen, nor heard of, or been able to find anything about this form of seal or signature on any Classical Chinese Paintings. The other thing I find peculiar, and have yet to determine if was common practice, is the small size. The painting itself is 17cm x 22cm (approx 6 13/16" x 8 3/8") without the silk border, total dimension with the border is approximately 8"x10:" which seems too convenient for modern framing, or perhaps it's just mere coincidence. The painting is of a fishing village with fisherman in a boat in the foreground, small villages in the hills and a solitary figure on a bridge mid way up the river. It is painted on some kind of "fabric", possibly silk which has hardened with age or perhaps linen. It has a traditional rice paper backing and silk borders which have hardened with age. The Chinese calligraphy reads; "The Year of the Rat, (month of) March. 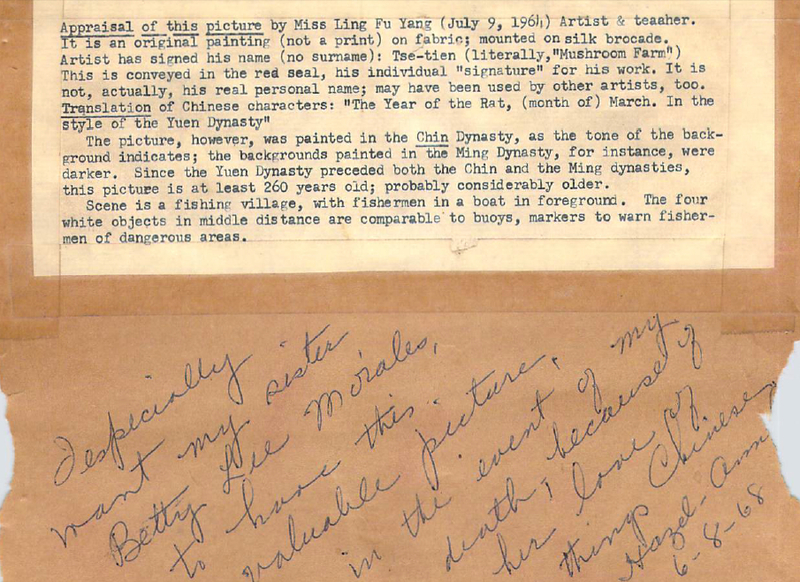 In the style of the Yuen Dynasty" One typically uses Yuan Dynasty and not Yuen, so my assumption is that Ms Ling Fu Yang used the Wade Giles form of Romanization, or more likely, used Cantonese, which would explain her use of Tien rather than Tian. Although painted in "the style of the Yuan Dynasty", the painting itself, according to Ling Fu Yang, "was painted in the "Chin Dynasty". I'm dumbstruck trying to figure out of her use of Chin is meant to be Ch'ing, for Qing Dynasty since Chin is more appropriate for Qin Dynasty which is certainly not the case for this work of art since Qin was thousands of years prior to the Yuan Dynasty. Note that Ching, or Ch'ing, is also Wade Giles Romanization as well as Cantonese. In her assessment of this painting, written on July 9, 1964, she states that the painting is "at least 260 years old; probably considerably older", which would make it at least 310 years old today, dating it no earlier than 1648 since Qing Dynasty began in 1644, to 1696 since 260 years prior to 1964 would be 1704 which was year of the Monkey, therefore, if at least 260 years old, my assumption is that it's dated between 1648 to 1696 if Ms Yang's assessment is correct, 1696 being the last Year of the Rat prior to 1708, although 1708 could also be a possibility. COPYRIGHT 2014 LITA KELLEY. ALL RIGHTS RESERVED.